In my last post, I gave an introduction to the process of RLD and how it can be applied to designing a simple jumping puzzle. When I posted the first part of this series on Gamasutra, it sparked significant debate within the community. Although tools don’t stifle art, their effectiveness is ultimately governed by the skills and knowledge of those wielding them. In many ways, this debate has remarkable similarities to the production of music. The production of music is (at least recorded music) is heavily governed by the use of tools. In any production environment it is not enough to have powerful tools they must be used by someone with skill in order to achieve a high quality end result and RLD is no different. With this in mind, I have decided to re-write the second installment of the RLD Handbook to acknowledge the similarities of RLD and music production by depicting the RLD process as a tool akin to those used in audio production. This article extends on the concepts discussed in my previous blog post, by taking a step back and exploring the more subjective primary metrics of RLD. I am going to use comparisons to the field of sound engineering to not only introduce these concepts, but also highlight that tools alone cannot create a quality game experience. Figure 1: The Avalon Vt Pre-Amp. An expensive tool, but nevertheless still a tool and not a magic ‘fix all’ device. In sound engineering, we can use a device known a pre-amp to take the less than ideal input from a microphone and shape it into something more desirable. The goal of using a pre-amp in sound recording is to take an imperfect input and fine tune it until it becomes a ‘perfect’ output. A preamp can take a weak input signal from a microphone and make it louder - we call this Gain. Filters can be applied to remove certain characteristics from the original signal which may detrimental to the overall quality of the sound – we call this EQ. Lastly, most preamps come with some type of system of dealing with anomalous peaks and troughs coming in from the input signals, ‘leveling out’ the sound to create an output with a more consistent volume level – we call this Compression. Preamps work in a linear, sequential fashion. We refer to this flow of sound as “signal flow”. An input signal enters at one of the chain and exits at the end. Gain, EQ and Compression can be added in varying amounts to tweak the incoming signal. Once the signal passes through the preamplifier it is inherently different and depending on the quality of the person operating the device, the sound should be much better. We can extend the concept of a preamplifier to Rational Level Design. If there was a pre-amplifier for fine tuning game experiences then it would operate in a much similar way to your typical audio pre-amp. We would have an input, which takes the current game state (what the player is currently doing). The designer would have a set of powerful parameters like Gain, EQ and Compression which they can use to ensure that the game experience is as a perfect as we can possibly make it. Unfortunately, not every game can ship with its own dedicated game designer whose job is to tweak the game on the fly. We can however, design our games rationally by using a system like a pre-amp to create a standardized system of fine tuning. Just like an audio pre-amp which has three core components (typically anyway) used for fine tuning, rational level design is governed by four primary metrics – each of which acts like the various stages of a preamp. In part one of the RLD Handbook, I introduced RLD as a way of objectively quantifying game elements to understand how they impact on difficulty. Ideally, we want our players to feel challenged without the game be too challenging and feel empowered without the game being too boring. The trouble with this approach is the player’s ability to deal with challenge is variable and somewhat unknown. 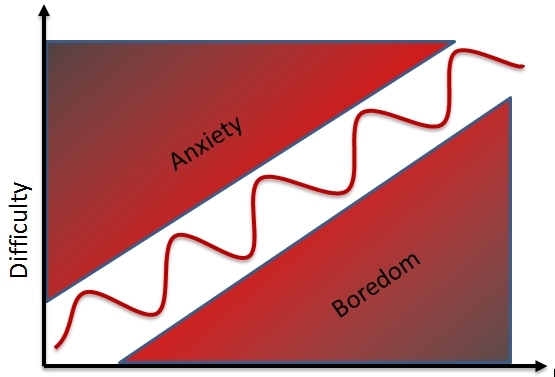 What we do know is that we can think of an ideal game experience as being the sine-wave type line that Schell describes as the flow channel (Figure 2). 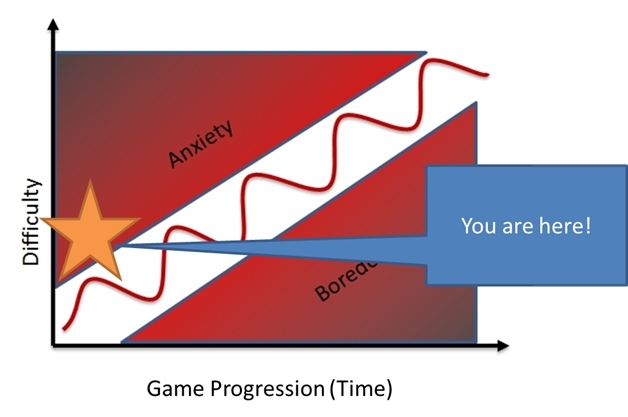 Figure 2: As our players become more experienced, we must ramp up the difficulty. The situational awareness control sits at the top of the signal flow hierarchy and has a global impact on everything after it. This part of our machine controls the amount of information that we are giving our player. Because situational awareness can take many different forms, this parameter of our machine has three different variables which I will discuss shortly. A set of “noise” faders are used to add or reduce the complexity of the games representational layers in order to either allow the player to focus on what is important, or hide what is important from them in a sea of information. If games are about the player deciphering complex patterns, then these parameters control how recognizable these patterns are. The next step in our machine is time pressure. 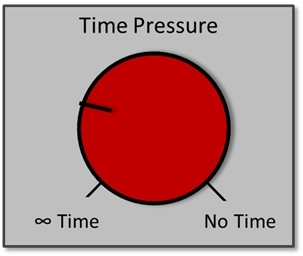 (Figure 5) Time pressure is a very powerful, yet easy to understand parameter. The less time we give someone to act on information, the more we increase difficulty. Although it could be argued that time pressure is possibly more powerful than situational awareness, the reason it is the second step in the RLD machine is because you can only expect someone to act on a problem once they are made aware of it, hence the need to situational awareness first. Figure 6: We can bypass this element of fine tuning when it is not required. Symmetry can be thought of as a type of cross-fader or panning control which alters the incoming difficulty based on the options a player has available to them, compared to the options that their enemy has. We can express this parameter as a ratio of possibilities. When the dial is in the middle, the ratio is 1:1, each player (AI or human) has the exact same options available to them – aka Symmetry. When the fader moves away from the middle, we begin to create Asymmetry which can be used to fine tune your games difficulty. If we are attempting to fine tune the difficulty of an environmental puzzle, then you should bypass this level of fine tuning as it is not applicable. Figure 11: Depending on the type of game, hour to hour gameplay can sometimes be a moot point. Figure 12: Star Control 2 – if you don’t have a pen and paper on you when you are playing the game AND taking notes, you are never going to finish it! 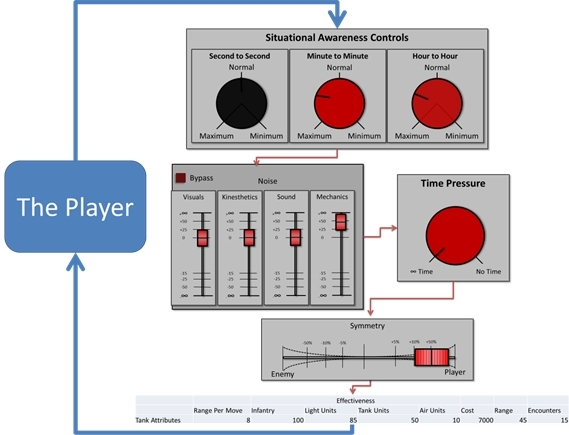 Although increasing situational awareness can help reduce the difficulty of various games elements, we are often limited by whether or not the player understands the information we are giving them. We refer to this element of situational awareness as comprehension. Optimal difficulty is often presented as a balance between too much challenge (frustration) and too little challenge (boredom). Ideally we want to keep the player in the “sweet spot” between these two opposing forces. The balance between too much information and too little information shares the same need for precarious balance between two opposing forces. 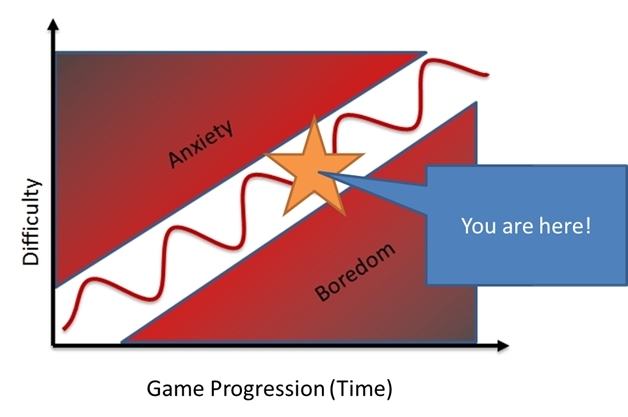 In order to understand how the situational awareness parameters impact on your RLD difficulty tables, you need to remember that your game will always have a “nominal” or normal level of situational awareness and that the purpose of our four primary metrics is to provide variable fine tuning of our game. Figure 14: My RLD table from the first part of the RLD handbook. Because we have not made any adjustments to our game since we did our testing and came to our RLD numbers, our RLD tables will remain unaffected. But let’s temporarily cause our player’s second to second information to be reduced (Figure 17). What happens then? In Figure 17, I have used a post-processing chain to alter our player’s view of the world temporarily. The player is faced with the exact same puzzle as I used in Figure 15, however the puzzle is now much more difficult. Subjectively, I could say that our primary metric would look something like it does in Figure 18. Figure 19: Note how certain permutations of the puzzle now become unavailable as they are too difficult. Figure 20: Getting used to using regression will help you with this task. Even basic tools like geometric means can be useful. The reason for using a value of 1.0 for the ‘average’ perceptual value is due to how the math’s of the four primary metrics effects any refactoring that you may need to do. If the value of your primary metric is 1.0 we are indicating that games current level of situational awareness is the same as it was when you gathered your initial testing data. Put another way, if our primary metric remains unaffected AND our subsequent metrics are in a transitive relationship, then our RLD element numbers will remain unaffected. Values greater than 1 should be treated as temporary and this is where we take away perceptual information away to increase difficulty. Values less than 1 should also be treated as temporary. For instance allowing the player greater field of view should be a temporary increase to reduce difficulty and raise empowerment. I most commonly find that deviations of + or – 20% are most common. Ultimately though, your numbers need to be based on testing data for the primary metrics approach to be effective. Not all players are the same though. A player’s familiarity with a game will enable then to deal with far more information than a novice player. With this in mind, we need to take our three different types of situational awareness information (perception) and multiply this by our player’s comprehension in order to understand the outcome of this stage of our fine tuning called projection. 2. Comprehension - It's all well and good to perceive things, but you need to understand your relationship with these items. What does your current situation mean for you as a player. Before moving on to the end result of situational awareness, (projection) we must now examine the factors belonging to the game design which impact on comprehension. To do this, I will explain the noise metrics and how they help us modify our players comprehension of situational awareness information. Noise is the extent to which superfluous information is used to overwhelm the player and obscure the simplicity of the task at hand. In the contexts of my RLD model, noise covers three representational layers of games (visuals, kinesthetic & sound) with an extra category dedicated to mechanics and the associated cognitive load. Keep in mind that a certain amount of noise is necessary as we require it for the purposes of feedback. Noise is therefor for a sub-component of perception which we can use to affect comprehension. In the contexts of my approach to RLD metrics, I have a slightly different take on what a “noise taxonomy” might look like. To a degree, the representational elements of noise are largely self-explanatory: more superfluous visual, auditory and kinesthetic equals more noise and a subsequent increase in difficulty. What is more difficult to grasp is the noise of superfluous mechanics. Mechanical noise is the amount of superfluous options available to the player whichmake choosing an appropriate strategy more difficult. Think of it this way, if you are tasked with slaying a dragon and you only have one offensive capability, then the mechanics of the scenario are straight forward. If on the other hand, you have the same task, and a myriad of offensive options, then deciding on an optimal strategy becomes a difficult task. You have many options, but which one will be most effective? 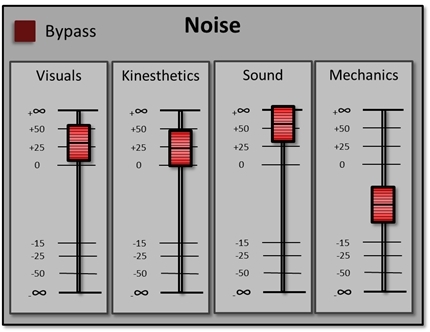 A good implementation of mechanical noise happens in Borderlands. In Borderlands (as well as many other well-crafted games), the player is slowly introduced to new mechanics – new weapons, enemy types, vehicles etc. 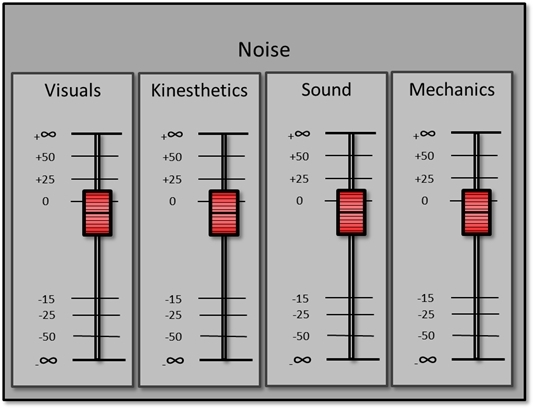 With each new element comes mechanical noise – “what is this new thing, how do I use it and when should I use it?” To assist the player with integrating the extra noise into their normal cognitive understanding of the game, the designers of Borderlands have created some simple rules for the player to follow which can be applied equally to all new mechanics. In the weapons classes, elemental effects have a very clear set of rules which define where they are most and least effective and this is communicated to the player using simple, graphical means. In Figure 22, the player is presented with a Green Enemy. Based on their previous indoctrination to the games mechanics, they quickly learn that acid (green) environmental damage will not work well on this enemy – they must engage with a different colored (an elemental) weapon to do maximum damage. Figure 22: Green Enemy? Don’t use the Green Weapon. It is important to emphasize that in the context of the Four Primary Metrics (and by extension, using RLD to fine tune gameplay) mechanical noise is a variable. 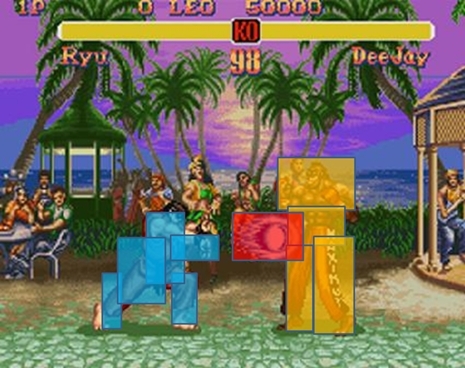 Games like Street Fighter 3 have all options/mechanics available to the player from start to finish. The mechanical noise in Street Fighter 3 is therefore a constant, not a variable and we cannot use the mechanical noise parameter to fine tune games like this. Mechanical noise should only be measured by the amount of new mechanics that we are adding into any given scenario, not the sum total of what the player has learnt so far. The reason for this is that players are adaptive. The more they use a mechanic, the less cognitive burden (and noise) it introduces. Introducing new mechanics, results in a temporary increase in mechanical noise and a slight increase in the difficulty of the current game scenario. If we consider that it is only the hit boxes and their relationship with each other which is important to the game of Street Fighter, then everything else is purely noise. Some of this noise is obviously designed to mask the fact that Street Fighter is more than just a collection of boxes in 2D, however visual noise can also impact on difficulty by distracting the player from what is important. Figure 24: The helper icons only appear once you get close enough to the pikcups meaning that the player needs to come up with a cognitive model for what “might” be a possible pickup area. Metro Last Light is a very basic game from a mechanical perspective, however visual noise is used extensively to mask this attribute, and as a way to make trivial tasks like finding pickups, more challenging. In Metro Last Light, pickups are hidden around the environment, with some of the better pickups having substantial more visual noise hiding their location. It is important to make a distinction between situational awareness and visual noise. Visual noise is the amount of superfluous visual information in game, and situational awareness is how easy the designers have made it for the player to identify these obscured elements. For example, the icons hovering above the pickups are used as an element of situational awareness to cut through the high levels of visual noise and assist the player in finding pickups. 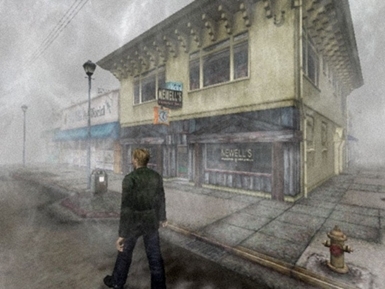 Figure 25: Not only does the fog make for a more tense game experience, it also reduces draw distance which can be problematic when you design a town which is flat and has straight streets! 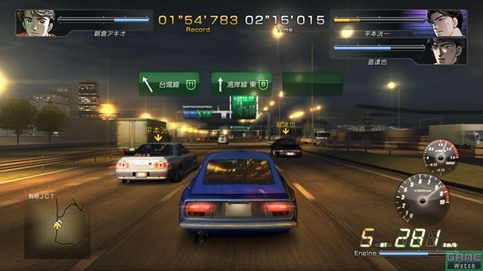 Figure 26: In Wangan Midnight, the depth of field effect only comes into play when the player it at full speed. It limits visual information in the players peripheral vision. Just like visual noise, Auditory Noise is information which intentionally obfuscates important auditory information is a sea of misinformation. Figure 27: This is a very simple encounter from a design sense, but made interesting and challenging with copius amounts of noise. 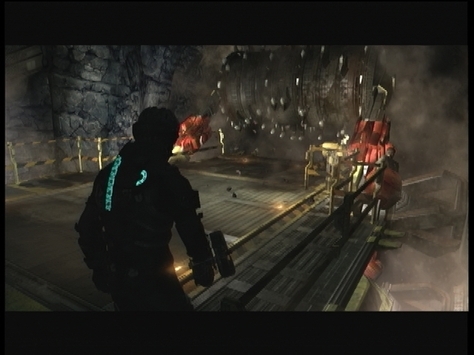 In chapter 12 of Dead Space 2, protagonist, Isaac rides atop of a very noisy drill as it crashes it way through an underground cave. Whilst the player is attempting to prioritize the incoming hostiles, they are also being besieged with a barrage of aural information which raises the player’s anxiety levels by bombarding them with a sea of aural information. Although it could be argued that the sound is an element of the games ‘aesthetic’ it also has an impact on difficulty. Not only is this section of the game extremely loud, but the player also has to listen in for various types of auditory information. The sounds of the approaching monsters help the player to identify approach vectors. Music is used to set the emotional expectations for the scene. Dialogue contributes to the narrative. Kinesthetic noise is the extent to which a player has to mentally track a number of moving elements within a game. Kinesthetic noise increases when tokens behave differently in terms of their movement speed, movement vectors and acceleration despite having the exact same visual attributes. Movement although being depicted using a visual modality needs to be treated differently to visual noise. Here is where I explain why. 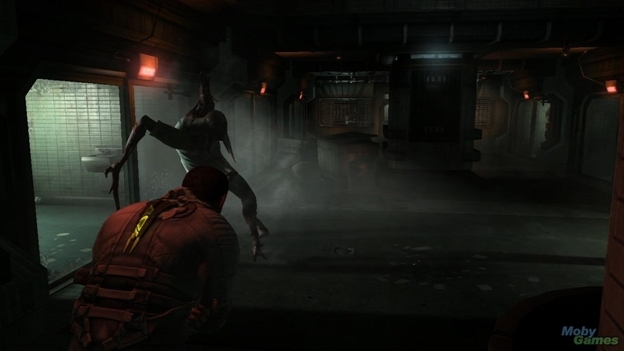 Increasing kinesthetic noise is often used a penalty in stealth games. Let’s say that we are playing a game such as Splinter Cell and the player is presented with a warehouse full of potential threats. Whenever the player first encounters a situation like this, the enemy is usually stationary and even if they are moving, they are doing so in a predictable pattern such as patrolling a hall-way or a perimeter. Now if, the player does everything right and eliminates these enemies in the correct order, whilst being as discreet as possible, the other enemies are non-the wiser and continue their predictable movement behaviors. Let’s say that the player is less than discreet and goes in all guns blazing. On face value, the penalty for this is now the enemies are seeking the player out and time pressure is increased, however the real change in difficulty comes from adding in significant amounts of kinesthetic noise. 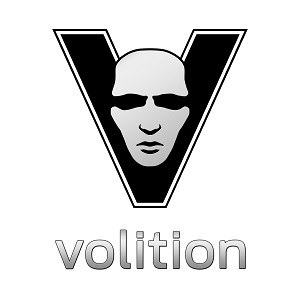 The player will now have a greater challenge managing the spatial relationships of the enemy AI due to their fast and often irregular movement patterns. 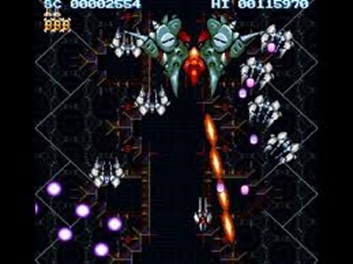 The genre of Shmups uses kinesthetic noise as a key element of difficulty. In Shmups like Guwange (Figure 28) barrage and enemy movement patterns tend to be more uniform at the beginning of the game with multiple projectiles and enemies sharing common movement vectors and speeds. Later levels will have far more independent movement vectors and speeds for barrages and enemies to raise the difficulty by introducing more kinesthetic noise. Figure 28: In the early levels of Guwange, although there are lots of bullets they tend to all share the same speed and movement vector. So instead of all acting independantly, they act in large groups with predictable behaviours. These predictable group behaviours are thrown out the window later in the game to make it a much more difficult experience. Due the lack of predictability introduced by kinesthetic noise, the player is less able to strategize and has to rely more on second to second decision making. As a result, difficulty is increased due to limiting your player’s projective capability. Noise often relies on some form of time pressure however if there is no time pressure,then noise levels can be extremely high when time pressure is not a factor. Noise works in a similar way to situational awareness in that you have noise which affects second-to-second game elements, minute-to-minute game elements and hour-to-hour game elements. 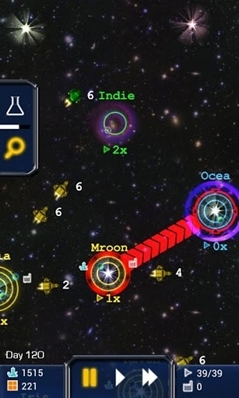 Figure 29: In games like Star Control 2 many of the text elements impact on hour to hour noise loops – that is, the ramifications of our pattern-solving behaviours will not have clear consequences until much later in the game experience. The reason why we need to apply this framework to noise is due to the fact that pattern recognition puzzles are not just spatial, but also temporal. Games test out ability to recognize important patterns and use them to our advantage. 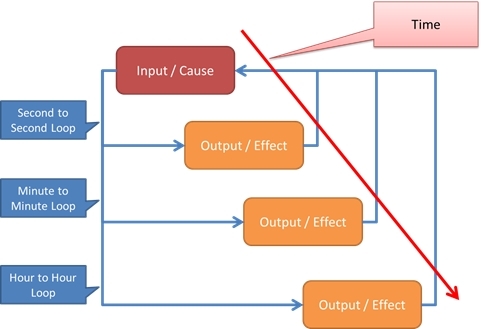 When we create temporal or spatial distance between cause and effect relationships, we are making it progressively more difficult for the player to understand if their actions have had a meaningful impact on altering the games systems to their advantage. The blue lines in Figure 27 which represent spatial and temporal distance is not noise but rather noise is the extent to which we “break” the transmission of effect back to the player. Think of this breakdown of the loop as the dotted line depicted in Figure 30. By introducing noise, we are making the player less certain of the impact of their actions as feedback is obscured. If I visualized what a noise control might look like, then it would be a simple set of faders, linked to our primary metric (Figure 31). Values of 0 would be our nominal level of noise with positive values indicative of added noise, used to stifle the player’s cognition of the scenario. Negative values mean we are using less noise and allowing the player to focus on only the most essential components of the game. Figure 31: Although noise can be bypassed, it rarely ever is. In terms of quantifying the impact of noise, this is something that needs to be done in the context of the type of game you are producing. As a rule of thumb, RLD re-factoring cognition values should be somewhere in the vicinity of 0.7 for maximum cognition and 2.0 for extremely limited cognition. Adding noise, one element at a time may only vary your values by around +/- 0.05 points for individual elements. Due to how open-ended this metric can be it is essential that you gather testing data early on in the process to help quantify your noise parameters. There is one last thing that you need to remember about noise and its relationship to comprehension. The only time when noise will increase a player’s cognitive load (and subsequently make the game harder) is when it is encountered for the first time. Figure 32 is a visualization of how adding new noise elements will impact on the player’s cognitive load. Although we see spikes in the player’s cognitive load, these spikes are only one dimension of understanding the impact of noise. In Figure 33, the noise events are far more difficult to deal with as it causes a higher, average cognitive load compared to the noise events seen in Figure 32. We can visualize this as a peak value, with an extended decay. I personally like to think of noise this way as it fits well with the framework of Badderly’s model of working memory. We have a finite amount of short term memory which can be allocated to dealing with new phenomena in our environment. Therefore, there is a finite limit to how many new chunks of information we can easily process at any given time. Further to this, we are besieged with information in the form of sensory input. We cannot possible pay attention to everything that is happening around us, therefor we need to prioritize what is important and what is unimportant. 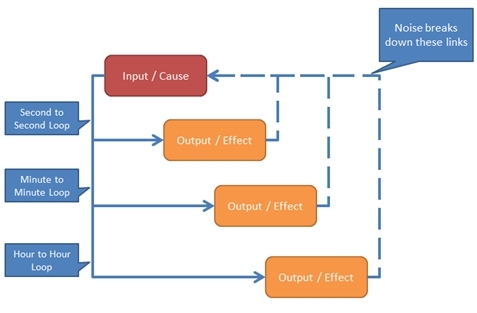 By introducing more noise, the designer is breaking down the obvious linkages between cause and effect which makes it difficult for the player to understand the immediate consequences of their actions. Noise is therefore a measurement of how a designer willfully obfuscates meaningful feedback, creating a play experience where actions are not clearly understood by the player. If we consider that projection the outcome situational awareness, comprehension and noise then we can consider situational awareness to be the following equation. I think of the player’s comprehension ability as a value between 0.7 and 2. I think of a value of 0.7 to be a complete understanding of the game and all of its elements and 2 as being a non-existent knowledge of the games representational systems. The reason why I have chosen these seemingly arbitrary numbers is based on experience and my personal system use to re-factor my RLD tables based on player experience. The logic behind this choice is that a severe lack of comprehension of your game tends to double the difficulty of your carefully crafted game elements. For example, a player who is learning your game (and genre of game) for the first time usually has a failure rate that is twice as high as a player who has some familiarity. On the other end of the spectrum, even players with expert knowledge will still have limits which are imposed by the game’s systems. Experienced players with higher comprehension tend to have a higher success rate during testing, but this is not usually twice as good as your “average Joe”. I give my average player a comprehension value of 1.0. By using this value, I am saying that my initial testing data has been found by using “average” players and subsequently doesn’t need refactoring. These numbers are personal and dependent on the type of game you are working on. If you really want to be methodical, you can use testing data to come up with more objective comprehension scaling numbers. Putting these numbers into context, giving the player lots of information is redundant if they don’t understand what it all means. Figure 34, taken from World of Warcraft exemplifies this. To the un-initiated, this screen shot is nothing more than chaos. Situational awareness is quite good, however as a consequence the level of noise will intolerable for novices. On the other hand, for an expert player who understands this information and what it means for them, their projective abilities will be much higher. If we applied our primary metrics to puzzle design in World of Warcraft, we may have a scenario is which all of our elements needs to be re-factored by a value of “0.568” in order to align with this player’s level of situational awareness and comprehension ability. Again, keep in mind that you can only successfully refactor minute-to-minute elements when you know how much minute-to-minute perceptual information you are adding or removing. The exact same rule applies to second-to-second and hour-to-hour. As a designer, you can meticulously craft game experiences, however there will always be external factors which may destroy your carefully laid out plan. Can the player customize the UI in terms of size and layout? Can the player re-skin the game, especially it’s UI? Can the player configure gamma or contrast? 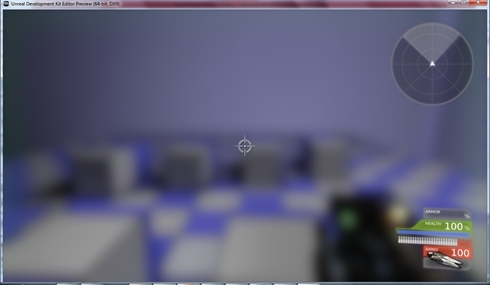 Can the player take control of the camera by either altering what it is looking at or moving it completely? Does the game store information such as notes and puzzle clues in a menu? Are there mini maps or radar systems which the player can use to determine their position relevant to other game objects. If you answered yes to any of these questions, then your player has very good situational awareness and you are running the risk of making a game experience which is too easy (or overwhelming). If your situational awareness dial is cranked to Spinal Tap levels then you will need to tweak your player’s experience by using the next step in the machine, time pressure. Humans are excellent ‘guestimators’. We use a process of informed guesses to arrive at a conclusion. Each time we guesstimate, we narrow down the range of possible solutions for our problem. More time, allows us to undertake more guestimation cycles to fine tune our decision making. Less time gives us fewer guestimation cycles and hence increases the probability of making a less than perfect decision. Just like situational awareness, time pressure is multifaceted and well researched. An article from 1994 by Hwang (Hwang, 1994) looks at how time pressure impacts on the processing of different types of perception. Hwang states that increasing time pressure increases task difficulty rather than task complexity which is exactly what we want from a fine-tuning perspective. So how can we represent the impact of time pressure mathematically? In all of my experiments where I have graphed testing data, I have never seen a set of RLD which is linear. Just like difficulty, your RLD values (even the ones you chose yourself) need to have some type of exponential growth rate. The reason for exponential growth is that all of your game elements will have a finite difficulty limit. For example, even if a player has the best comprehension of your game in the world, this comprehension does not allow them to overcome the effects of gravity (Figure 35). (Unless there comprehension skills are used for haxorz!). Coming up with re-factoring values for time pressure also needs to adhere to this rule of thumb. In terms of re-factoring, I tend to use a value of 1.0 to express a scenario in which there is no time pressure. I use an exponential growth pattern to develop a series of re-factoring values to express increasing time pressure. From my experience, you will only begin to see drastic increases in the effect of time pressure when you near the extremes. For example in Sonic the Hedgehog the ten minute time limit causes a very slight increase in overall difficulty of second-to-second gameplay elements. If I was to take a guess, I would say that the 10 minute time lime would re-factor your second to second elements by a value of 1.000001 – i.e. next to no impact. If the time limit for Green Hill Zone went from 10 minutes to 30 seconds (it can be done in 25 seconds!) then I would anticipate that your testing data would reveal a doubling in errors made by novice testers. There is one curious characteristic of time pressure which defies the exponential growth logic. In research conducted by Hwang in 1994, a review of the literature revealed that adding time pressure can actually increase performance, at least in the workplace. Hypothetically we could extend this to a player’s performance in games; however whether this would make a significant change to your refactoring is an unknown. Time pressure will have an effect on all three gameplay elements and is most powerful when it impacts on all three. 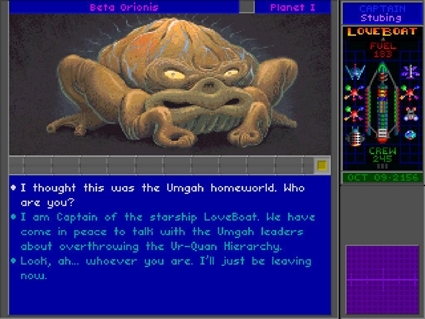 Games such as the previously mentioned Star Control 2 apply time pressure to all three gameplay elements making for a very tough game to defeat. 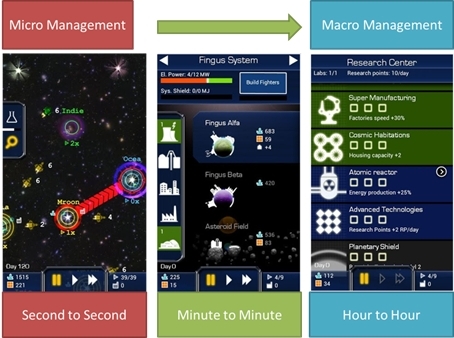 On the other hand, games like Star Colonies (Figure 36) use time as a type of resource in the economy. Your success in the game comes down to how efficiently you can use each ‘piece’ of time in comparison to your enemies and is therefore not an element of difficulty re-factoring. This part of our RLD fine tuning machine is primarily concerned with symmetry or asymmetry of game mechanics. In my approach to game design, I recognize that mechanics are actions which are used by game agents, (both human and AI) in order to tip the games systems eco-system in their favor. When the player has more options at their disposal, usually the games difficulty will favor them. When the enemy has more options, usually a games difficulty will increase for the player. The reason why I emphasize the term “usually” is because this metric is delicate balancing act (just like situational awareness). Disempowering the player and giving their enemies skills which they believe that they should have will work against a player’s sense of justice and turn players off your games. On the other hand, giving your player too many options can remove the challenge from a game or in certain circumstances confuse them. Before we talk about asymmetry, let us first look at symmetry. Any game which gives all game agents (players) the exact same options can be considered to be symmetrical. The most recognizable game which falls under this category is chess. Each player has the exact same tokens on the game board and they all act the same way. The only thing which separates player one from player two is who goes first. In the realm of video games there are very few which can be considered truly symmetrical. In fact, it was early arcade (& supercomputer) games like Space War! and Pong which are some of the only truly symmetrical video games. (Which we can largely attribute to a lack of CPU cycles for AI!). From an RLD refactoring perspective, symmetry results in a refactoring value of 1.0 – i.e. no impact. The best way to understand this metric is to think of it as a ratio between what the enemy can do, versus what I can do as the player. Shmups are a good example to understand this metric and why it needs to be expressed as a ratio. 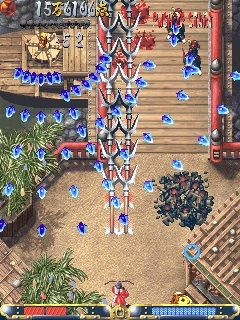 In your typical Shmup (Figure 37), the player is a one man (or woman) army, often having to destroy hundreds, if not thousands of enemy’s to reach their objective. If the enemies had the same mechanics available to them as the player, then it would be doubtful even the most skilled human player would stand a chance against a well-tuned AI. However, in Shmups the ratio is squarely in the players favor. The player can move and engage as they see fit, often with superior firepower, speed and dexterity. The enemies on the other hand are more often than not locked into pre-determined patterns and offensive configurations. Put simply, if we just consider the fact that the player can move freely and the enemies cannot, then our ratio is already disproportionally in the players favor at 2:1. 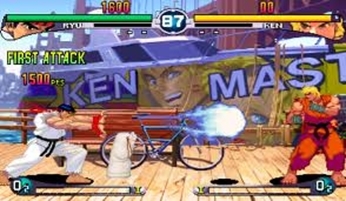 On the other hand, we have games like Street Fighter 3 Third Strike (Figure 38). If we ignore player tiers and special abilities, generally speaking the ratio for player possibilities to enemy possibilities is close to 1:1. Symmetry in games like Street Fighter 3 Third Strike is kept in check by simple, yet powerful balancing strategies such as design skeletons. Beyond the usual counterbalance design considerations, one of the hardest parts of designing a good 1v1 fighter is creating an AI that is flawed enough to resemble a human player. During this final battle, the player is given the upper hand by empowering them with far more options than their enemies. In this example the player has a number of things in their favor. Firstly, the player does not have to move outside of their cover, meaning that they can stay behind the barricades which separate them from their enemy and use this cover to mitigate risk. The enemy on the other hand, has to ‘jump’ over the top of the barricades to engage the player, leaving a larger hit box for the player to target compared to their own. 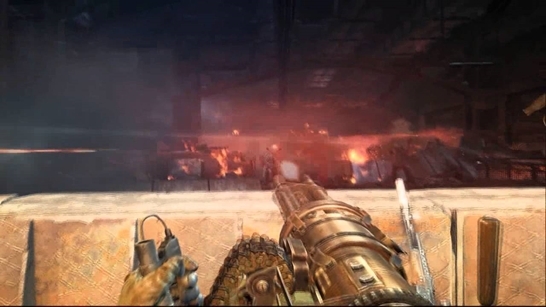 Although enemies can strafe, the designers of Metro Last Light have removed this from the enemy movement design of the first and last waves of this final battle. The player on the other hand can strafe to take cover. The player has a huge amount of ammo and powerful weapons available at their disposal which are littered around the environment and only accessible to them. The Enemy is limited to weak weapons in comparison. We can break this battle down even further by thinking about it purely in kinesthetic terms. Figure 40 is a planar view of the first wave of enemy attacks in the final battle of Metro Last Light. 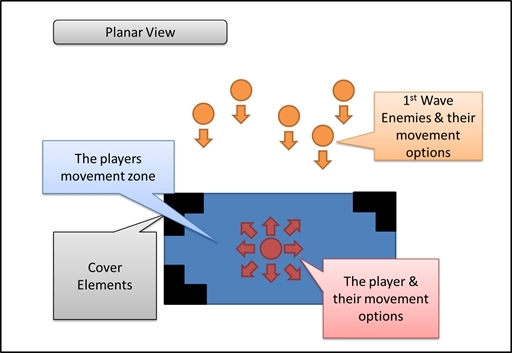 This planar view dissects the movement opportunities of the player versus the enemies. 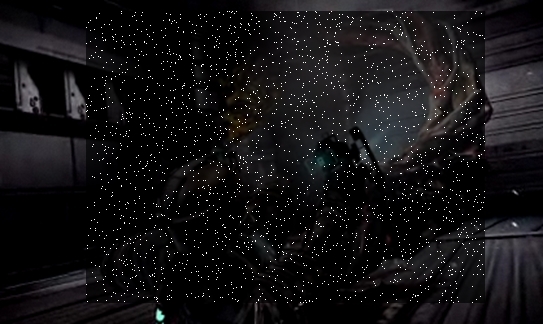 We can see that the player has cover available – the enemies do not. The player also has far more movement options available to them. 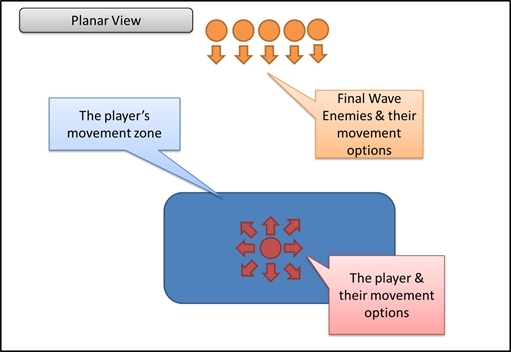 They can move in any direction within their defined movement zone, whilst all of the enemies in this first wave are only able (or designed) to move towards the player. 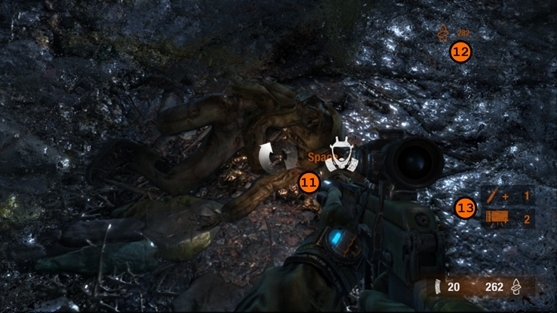 Figure 41 is a planar view of the second wave of enemies which the player encounters in this final battle of Metro Last Light. 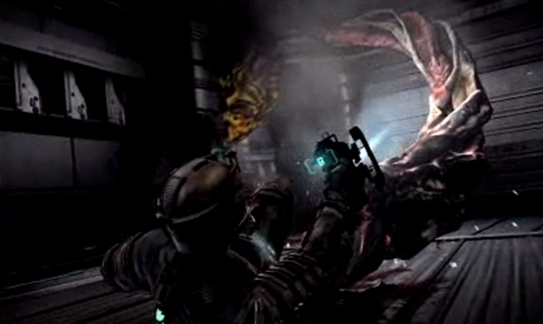 Here the difficulty has been increased using the primary metric – the enemies are no farther away hence reducing visual fidelity in the second to second game-play. The enemies now have two movement axes which they are designed to use as opposed to only one in the first wave. 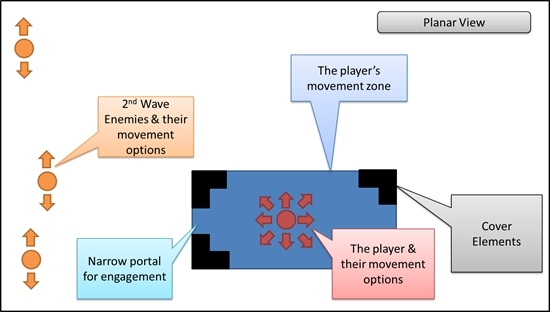 Interestingly, due a combination of the rectangular shape of the player’s movement zone and the occluding effect of player’s cover elements, the player has far less movement options available to them as they can only engage the enemy through a very narrow portal. As this is a very difficult scenario in comparison to the first wave, fine tuning needs to occur to balance this scenario and ensure it fits within the difficulty flow channel. As an element of fine tuning, there are far fewer enemies that the player has to dispatch during this wave and although the enemies can move on two axes, they move very slowly (an element of fine-tuning the time metric) and predictably. The final wave that the player encounters is very similar to the first wave and on first appearances seems much easier (Figure 42). 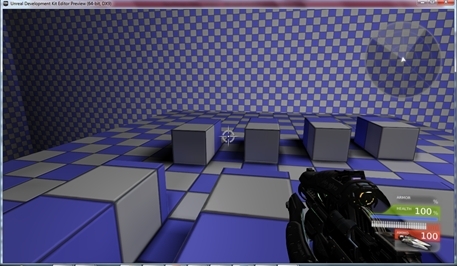 Enemies move in a slow, predictable pattern towards the player along a single axis. 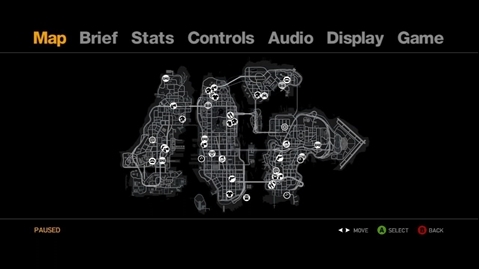 And the player once again has a wide portal for engagement which is no longer occluded by cover elements. From what has been covered so far, we know that because the player has a clear view of the enemy, situational awareness is high. 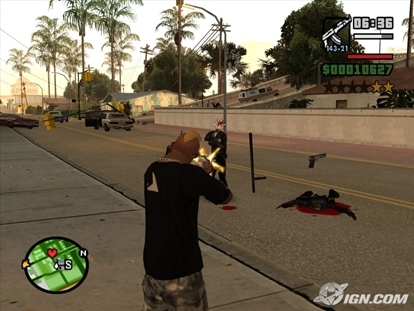 In addition to this, the player has more movement options available to them compared to the enemy and lastly, the player has a significant amount of time in which to act. This begs the question – how have the designers made this final wave more difficult than the first wave, even though many of the parameters are in the player’s favor? 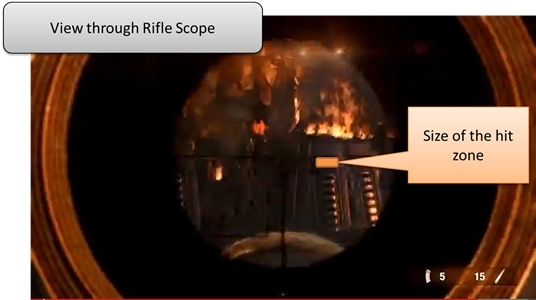 Figure 43: If you wasted your sniper rifle ammo prior to this point, your going to have a very frustrating experience. The designers have engineered this last enemy wave so that the hit box required for success is tiny! (Figure 41) Without the use of either a sniper rifle or excessive amounts of ammo it is next to impossible to achieve victory. The player has a very small window of time to shoot an extremely small hit box highlighted in Figure 43 in order to expose the enemy’s week point. If we view this problem from the perspective of situational awareness then we have a scenario where the minute-to-minute situational awareness is very high – enemies are far from the player hence have an exaggerated amount of telegraphing. 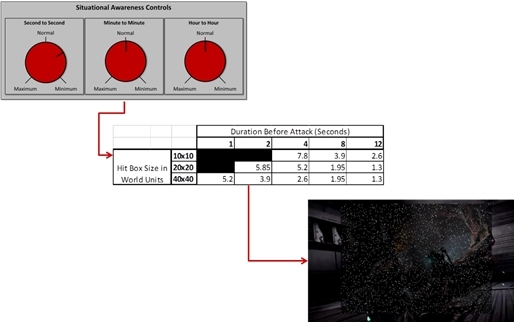 This high minute-to-minute situational awareness is offset by a very low amount of second-to-second information and this is represented by the absolutely minute size of the hit box (Figure 44). As this element of the game is a second-to-second type puzzle the extra minute-to-minute information does very little to offset the extreme lack of second-to-second situational awareness. Ideally, we want to be able to re-use this game element a few times in our game to warrant the actual development cost of making the element in the first place. To achieve this, we can apply our four primary metrics to recycle this game play element by creating variations. As this is a second to second gameplay element, I know that making adjustments to second to second situational awareness will have the biggest impact on the element. We now have a refactored puzzle which helps us to re-use this game element a few times in our without feeling too hard, or too easy. Thanks to our testing, the game designers know that we shouldn’t consider using the permutations of this element which are blacked out as these values now exceed our ceiling value of 8. This example also demonstrates how certain game elements cannot be re-factored using all of the primary metrics. Applying time pressure via the primary metrics is a moot point because it is already built into the design of the game element. Further to this, the symmetry metric is already accounted for in the normal implementation of this element. Although the mathematical method of refactoring and deconstruction of this game play element is a little naïve, it does demonstrate how metrics can be used to re-factor existing game tokens. Although the main use of the four metrics is primarily focused on difficulty re-factoring and dynamic difficulty adjustment, we can look at how these metrics have been “hard-coded” into a number of existing games to gain a better understanding of how they work in practice. In this section, I will present two simple examples of where these metrics have been used to re-factor the difficulty of certain game tokens based on the player’s progression (and skill level) within the game. I will eventually build upon the implementation of the four primary metrics in subsequent updates to the series. 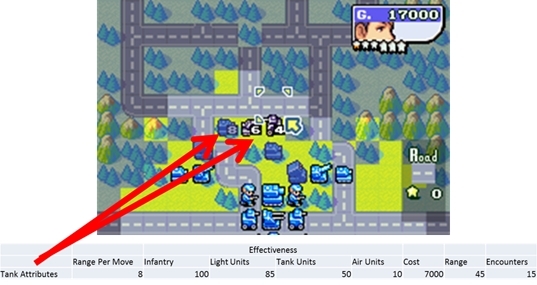 In the case of games like Advanced Wars, we can reduce situational awareness on later levels to increase difficulty rather than introduce a whole set of new game tokens. 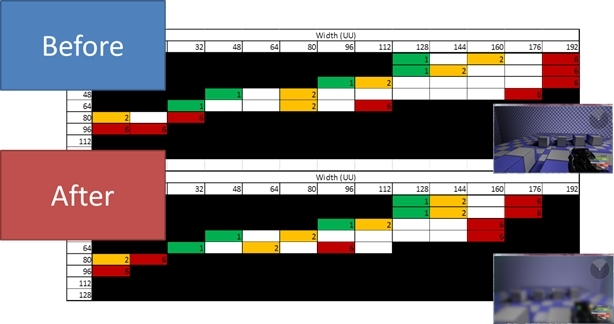 In Figure 52 both players are engaging each other with the exact same token (tanks). The player would have engaged tanks at a very early stage in the game and their attributes have not changed since this first encounter. What has changed, are the circumstances in which the player is engaging this token. In Figure 52, the situational awareness dial has been turned down, favoring the AI (Purple Tokens). If we used our primary metrics ‘machine’ to visualize this scenario then Figure 53 would be a good representation. Minute to minute and hour to hour situational awareness is reduced by using fog of war. This will immediately increase the difficulty of dealing with even familiar game tokens. As a counter balance though, the symmetry is clearly in the players favor. The designers have significantly increased the asymmetry of game mechanics in the players favor. The enemy has two tokens available to use in this current screen, whilst the player has 14 units at their disposal. Figure 53: There is no second to second gameplay because it’s all entriely automated and a product of the minute to minute decisions you make. 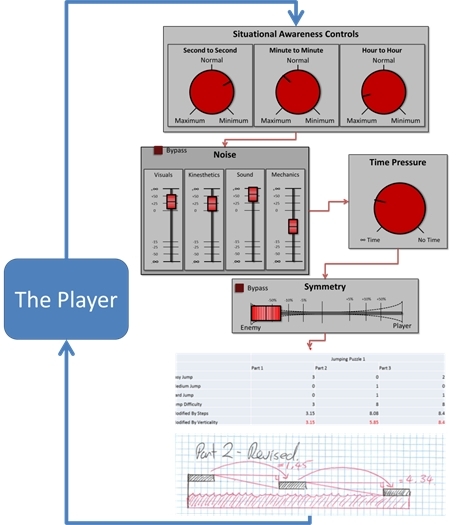 Figure 55: You can choose to manipulate the flow channel to achieve your narrative pacing requirements, however you always need some type of contigency to cater for players who may not be able to cut it. In this post, I have taken a look at an aspect of RLD which can be used in a slightly more subjective way. Regardless of whether or not you use the RLD process, I believe that the use of these primary metrics can be easily integrated into any game design experience. In the next part of the Rational Designers Handbook, I will look at how we can mathematically quantify the four primary metrics and how this translates into difficulty tables. This explanation of the “Flow Channel” is derived from Jesse Schell. The art of game design a book of lenses. Elsevier/Morgan Kaufmann, 1 edition, August 2008. Earnest Adams – Games are about equilibrium. For more information on the psychology of strafing, please take a look here. Hwang, M. I. (1994). Decision making under time pressure: A model for information systems research. Information & Managerment, 27, 197-203. Vessey, I. (1991). Cognitive Fit: A Theory-Based Analysis of the Graphs Versus Tables Literature. Decision Sciences, 22(2), 219-241.